Summer provides great opportunities for families to spend time and learn together in ways that can expand classroom learning: exploring the outdoors, taking trips, more self-selected reading, connecting with friends and family, and extended play. Unfortunately, for many children, exposure to these activities during the summer tends to cut along socio-economic lines, resulting in significant learning loss for children coming from lower income households. Learn more about the research behind summer learning loss on our blog post here. At ReadyRosie, we believe that families do not need money to have a rich summer experience, but they do need resources and ideas. We know that families can take advantage of everyday summer activities and keep the learning and exploring happening all summer long when given the tools and inspiration. This program made me realize the importance of slowing down, and being intentional when I am with my children. I brought fun into learning and everyday was a day to have good conversation about things she was interested in. 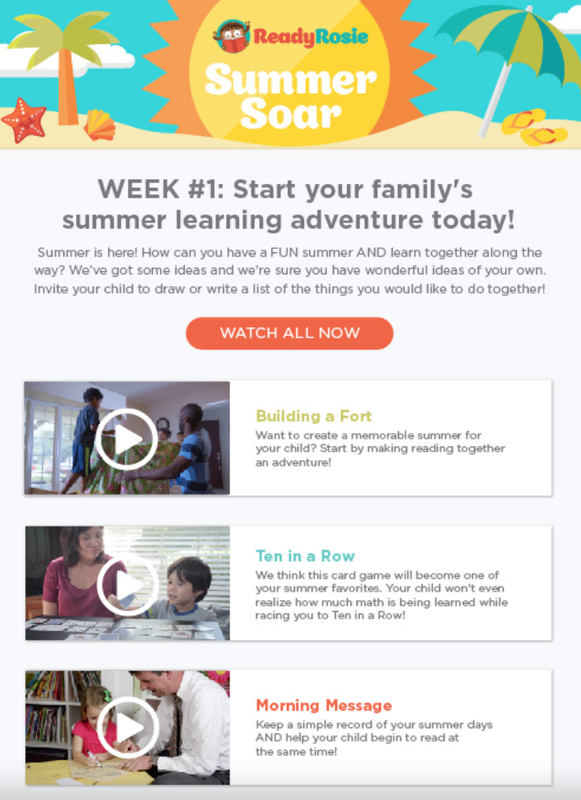 ReadyRosie is now helping to scale this idea by introducing Summer Soar, a 8 week series of curated video playlists designed to give families relevant ideas, games, and activities throughout the summer. 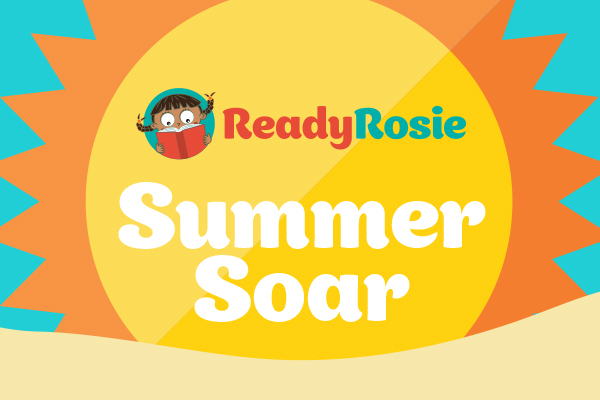 Every ReadyRosie partner school and community has access to this and every family who is registered to receive ReadyRosie will begin receiving the Summer Soar content on June 12th. SPREAD THE WORD TO YOUR TEACHERS – we’ve created this flyer to help let teachers know about this resource as well as specific details for each week of content. If your teachers are using ReadyRosie Share, we will also be emailing this info to them. SPREAD THE WORD TO YOUR PARENTS – make this part of your summer learning strategy. Here’s a flyer in English and Spanish that makes parents aware of the new content coming out for them this summer. MAKE SURE ALL YOUR FAMILIES ARE REGISTERED – this provides a good chance and reason to get more families signed up with ReadyRosie. Make sure all your current enrolled families are registered and also consider a strategy to get your incoming PreK and K families signed up in time to receive this summer content. CUSTOMIZE USING READYROSIE SHARE – if your teachers are using ReadyRosie Share, encourage them to schedule two messages throughout the summer to their families to personalize the connection and encourage the use of this resource. TEXAS SCHOOL DISTRICTS… - As you know, summer learning loss can especially impact the transition from preK to Kindergarten and the Texas Kindergarten Entry Assessment (TX-KEA) will be rolled out this coming Fall. Learn more about this and how ReadyRosie can help.